KOMPAS.com - Who is not familiar with the crust of the egg?Betawi typical snack is not only popular with residents of Jakarta, residents outside Jakarta were many who enjoyedsnacks scrambled egg-like these. It was delicious not be separated from the materials used,namely white glutinous rice, chicken eggs, fried dried shrimpdried up like shredded, and added fried shallots, then given arefined flavor of roasted coconut, red chilies, kencur, ginger ,pepper grains, salt and sugar to add delicious flavor. Currently, hawker Betawi is increasingly difficult to find. On a typical day, the crust of the egg can be found at several tourist attractions such as Setu Babakan, Jagakarsa, South Jakartaand Forest City Srengseng, West Jakarta. At certain moments, such as in the framework anniversary of Jakarta, the crust of the egg can be found at Pekan Raya Jakarta, Kemayoran, CentralJakarta. But the question arises, this egg crust original hawker.Sunda or Betawi? Because the majority of traders egg crust that existed in Pekan Raya Jakarta (Jakarta Fair Kemayoran now) is the origin of Sunda, West Java. Because of the crowd of traders crust egg in PRJ use of Sundanese discussed when talking with friends seprofisinya. "Food Betawi why the sale of the Sundanese," the word that comes out of one of his buyers. Ironic indeed merchant or maker egg crust in the area of ​​the Jakarta Fair terror crust is dominated by traders from outside like from Garut Jakarta and Bandung. "Of the approximately 400 merchants in PRJ egg crust, almost all the Sundanese mas," said Hamid, a trader crust terror that comes from Cimahi, Bandung. Recognition Hamid is very surprising. Because, as a cash food Betawi, crust egg seller in PRJ majority came from Sunda, West Java. While originating from the original Betawi only amounted to tens. This phenomenon is proved, the seller's crust egg increasingly desikit Betawi origin because there are no children and grandchildren who continue the business of this hereditary or due to being displaced by modern food from outside, such as fast food and so forth. Doubts are increasingly evident with the explanation Asep Ruslan (26), one egg crust traders who came from Garut. Asep admitted every year when PRJ opened, about 800 people organized egg crust merchants dispatched from Bandung.Traders are ready to enliven the show anniversary summit in Jakarta. 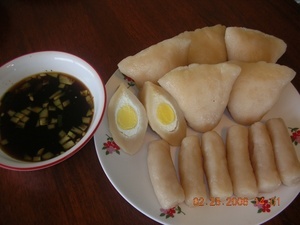 According to Asep, egg crust is also found in many areas of Bandung and Garut beberawa. In Bandung crust egg into the diet remained in the area Gasibu, Gedung Sate, Bandung.While in Garut, cash food is always adorned tongkrongan Betawi young people in the cemetery, Guntur, Garut, West Java.So what about in Jakarta? In Jakarta alone the crust of the egg becomes a scarce food. It's so hard to find. Only in some places just the traders who sell them, and even then only a few bedagang with relatively small amounts. Like the crust of the egg that is in Setu Babakan.Here, only dozens of traders who sell them. In addition to the Setu Babakan, South Jakarta, egg crust is also sold in the area of ​​Pekan Raya Jakarta (PRJ), Kemayoran, Central Jakarta. And even then only once a year, even the majority of sellers did not come from indigenous communities betawi or Jakarta. In other areas, the presence of egg crust are quite rare. This condition is so poor. As a special food Betawi Betawi were only a handful of residents who popularized this hawker. Not limited to that, the young Betawi felt reluctant to continue the business of this hereditary. Evident from the majority of traders egg crust that comes from the Sunda betawi inherit from the original residents. As stated Hamid (39), one egg crust traders from Cimahi, Bandung. Himself confessed to learn to make the crust terror of the Betawi people who live in Warung Buncit, South Jakarta.Reason Hamid willing to learn so simple. Because there is no descendant of the `Guru` is willing to learn, then her children replace the teacher, of course with the underlying desire to try. From here we start mengkwatirkan existence crust snacks hereditary egg will move peradapannya. And it is not impossible egg crust that used to be cash Betawi food will turn into cash food community in West Java. Because of this, typical snacks nan Betawi this rare should be preserved!